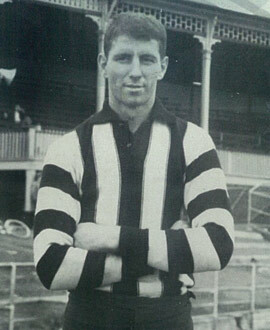 Fellowes, who played 66 games in the black and white between 1956 and 1964, will be forever famous for his role in the Magpies’ 13th premiership in 1958 in which he was named first ruck. The ’58 decider remains one of the club’s most storied triumphs. Collingwood managed to deny Melbourne its fourth premiership in succession and in doing so protected its record of four flags in a row between 1927-1930. Fellowes kicked one of his side’s 12 goals for the day as the Pies held on to win by 18 points in what was only Fellowes’ 11th senior game. Recruited from Maffra, a town located 220 kilometres east of Melbourne, he debuted in 1956 but didn’t become a regular in the seniors until midway through 1959. He then played 18 of a possible 21 games in 1960 including the Grand Final loss to Melbourne. The following year, Fellowes polled seven Brownlow votes from 10 senior games. His time at Collingwood ended in a drawn match against Carlton in round 16, 1964. He played 66 games, kicking 22 goals predominantly in the No. 28 jumper. Fellowes later served on the club’s board and his son, Wes, went on to represent the club and win the 1986 Copeland Trophy. Fellowes’ sons both paid tribute to the opportunities afforded to them by their father. Ashley, Graeme’s youngest son, said his famous father had paved the way for several footballers to join the workforce during their VFL/AFL careers. He said: “During dad’s career as manager of Allwares Bulk Discounts in the city, he was generous enough to offer many aspiring footballers the opportunity to work for him whilst they were forging their careers. “Gavin Crosisca was one that was a prominent staff member. Reflecting on his father’s influence on his 102-game career, Wes said: “Without you Dad, and your support, encouragement and devotion, I would not have played football at the highest level. Former teammate Keith Burns remembered Graeme Fellowes as one of the tallest players the club had seen to that point in its history. “He was one of those very good tap ruckmen who could tap it to a place where a rover could go and pick it up. That was his main strength, his tap rucking,” Burns said. “He was the tallest bloke in the AFL in his era. The nearest one to him was probably 6’ 4’’.